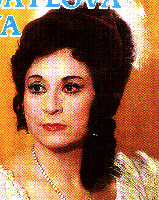 The soprano Blagovesta Karnobatlova-Dobreva was born 24 January 1936 in Varna. She graduated from the State Music Academy in 1960 as a student of Ilija Jossifov. She continued her studies in Milan in 1965. In 1962 she won the silver prize in the Helsinki International Student Festival and in 1963 the second prize and silver medal at the International Competition for Young Singers in Sofia. Her debut was in Varna as Violetta in Traviata on 13 January 1961; she sang there from 1960 to 1966 when she joined the Sofia National opera where she remained during her long career. International appearances took her to Italy, France, Austria, Germany, Spain, Holland, Belgium, Czech Republic, Ukraine, India, Cuba, Korea, Peru, China, Algeria, Denmark, Switzerland, Greece and Turkey. From 1971 she was a well known pedagogue at the State Academy of Music. Among her students were Liubomir Videnov and Ludmila Hadjieva. Major roles in her career included Mimi, Gilda, Violetta, Marguerite, Liu, Tatyana, Pamina, and Leila in The Pearl Fishers. Gounod: Faust "Marguerite's Aria - Act II"